We've all read the apocalyptic tales handed down since the Old Testament's Book of Revelation. We've all speculated on the the possibility of the end of the world coming as the result of a nuclear bomb, an alien invasion. . . heck, if the AMC TV network had their way, it could be the Walking Dead that wipe out the planet. But, the world ending by 'man's best friend?' What happened? What could possibly cause our most beloved pets to go postal on us? The recently-awarded Hungarian movie "White God (Fehér Isten)' is catching all the buzz at the 67th Cannes Film Festival this year. It stars over 250 four-legged would-be thespians, all of which have been trained to turn on their masters. Sounds like heavy-duty 'method acting,' wouldn't you say? 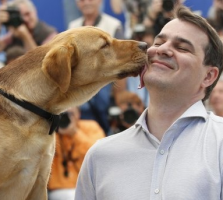 And to boot, the Cannes' most unique and appropriately named film award, the 'Palm Dog' was presented to these canine actors, in addition to the prestigious Un Certain Regards Prize. Woof! Woof! Kornel Mundruczo & one of his dog actorsThe horror-film's director, Kornel Mundruczo, was all laughs and smiles at the ceremony to collect his trophy, which came in the shape of a large furry bone. But then quickly got serious to alert the audience that the dogs in the film were used to make a serious statement about the oppressed and marginalized. "I always use dogs to symbolize minorities," Mundruczo said. "I wanted to tell this tale as a metaphor about the European fears about dealing with minorities." It's the director's concern that there is rise of nationalist parties across Europe. In his home country of Hungary, a far-right party is the third largest group in parliament. Hagen, the movie's pooch protagonist, is played by real-life twin Labradors Luke and Body. The plot line unfolds like a parable where this dog is shunned and all his gentleness is bashed out of him, ending up toughened and unrecognizable - transitioning into the lead dog of the pack. Mundruczo said it took every directorial brain cell he had to get the unpredictable animals to light up the screen in the way he intended. "Dogs cannot lie on camera, it's very challenging," he said. 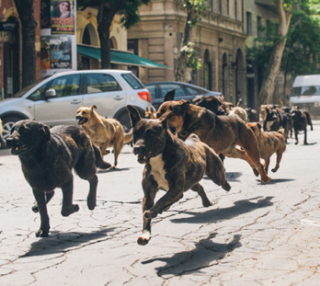 All the dogs had to be socialized together for six months prior to shooting the film in order for them to be convincing in the pack scenes, he added. Based on the premise, that all of us (including animals) have a breaking point -- triggered when enough is enough -- the film explores how Hagen and his kind must learn how to survive after a society declares canines no longer desirable to live with. Well, at least there is motive as to why these mongrels would ignite a doggie apocalypse against mankind. Perhaps, Mr. Hitchcock when he applied a similar theme to The Birds all those years ago might have given similar thought. 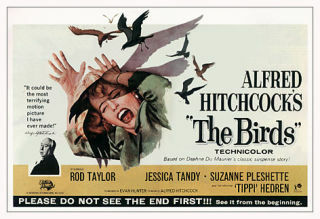 It's been 51 years since that horror flick actually made us quiver whenever we heard a brood of birds chirping -- yet, we never knew why our winged friends became so pissed off at us, humans? This Dog Dances Better Than I Do! The Merengue Animal Video of the Day!!! Baby Kiwis -- The Odd Looking Animal Video of the Day!!! Stuck in the Middle! : Cute Animal Video of the Day! Jaguar Attacks Crocodile! The Crazy Animal Video of the Day!! !